Small size controller, up to 0,8 m wingspan. 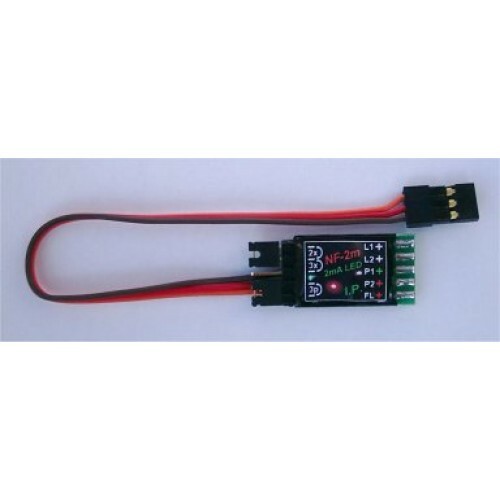 5 LEDs 1,8 mm (plastic version) / 3 mm (indoor version): 2x Position / 1x Flashing / 2x Landing. Power 4 V-5,3 V (from Rx). 2p/3p control. NF-2m (mini) unit is a reduced (smaller) version of NF-2RC designed for illumination of small "Indoor" and "ParkFly" models with color ultra bright LEDs (Light-Emitting Diodes) 10 or 20 mA with diameter of 1,8 and/or 3mm. It can be used also for illumination of plastic models with SMD LED diods. 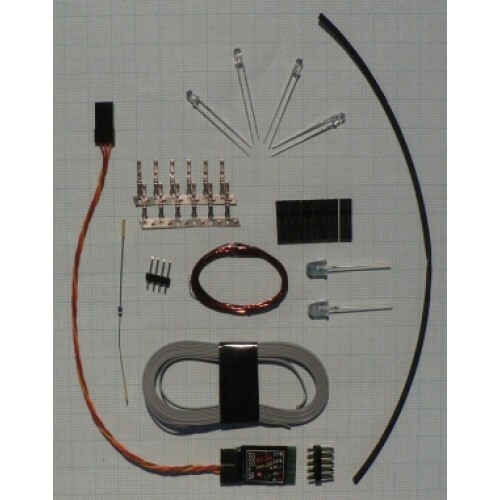 The unit are powered directly from the receiver with the 5V BEC and is compatible with Graupner or Hitec-type connectors. Five (six) lights are available: 1x green position (P1), 1x (2x) red position (P2), 1x red or white flashing (FL) and 2x white landing (L1 et L2). The anti-collision light flashes once per second. The jumper contacts make possible to set the number of flashes of the anti-collision light between 1 and 3. With jumper on position "2x" or "3x" the unit produces two or three flash pulses. Without jumper, the light make one flash pulse. If controlled by pilot, the jumper "3p" allows you to select between 2-position (Fly / Landing) and 3-position (Off / Fly / Landing) control by the remote controler. With a 2-postion control the position and anti-collision lights are always activated. However, the landing lights can be switched on and off. In the three-position control system, all lights are off in the first position (Off). In the second position the position lights and anti-collision flashing lights are on (Fly) and in the third position, all lights are on (Landing). Anti-collision and landing lights automatically begin to flash when the plane is unnable to receive a signal from the remote controler. The unit can be used also as non-controlled. The unit is in non-controlled mode if the orange (signal) wire of Rx cable is not connected to the receiver. In this case the lights start work when the unit is connected to the accumulator and the "3p" jumper can be used to switch manually the landing lights off. So the unit can be connected directly to the accumulator using red and brown wires of the Rx cable. But the ACCU voltage cannot exceed 5,3V (max. 4 cell NiCd or NiMH or 1 cell LiPol) otherwise the unit will be broken. With 32mA on nominal current, light circuits burn only a little bit more than 1 % of capacity of a 700 mAh accumulator during 10 minutes of fly.